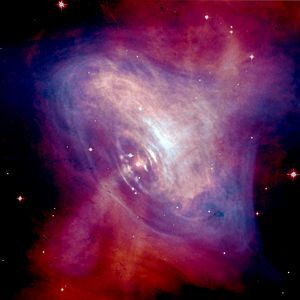 This image of the Crab Nebula was created by superimposing the X-ray (blue), and optical (red) images. The X-ray image is smaller because the higher energy X-ray emitting electrons radiate away their energy faster than the lower energy optically emitting electrons as they move. X-ray astronomy is an observational branch of astronomy that focuses on the study of celestial objects based on their X-ray emissions. These emissions are thought to come from sources that contain extremely hot matter, at temperatures ranging from a million to hundred million kelvin (K). This matter is in a state known as plasma (ionized gas), which consists of ions and electrons at very high energies. Astronomers have discovered various types of X-ray sources in the universe. They include stars, binary stars containing a white dwarf, neutron stars, supernova remnants, galaxy clusters, and black holes. Some Solar System bodies, such as the Moon, also emit X-rays, although most of the X-ray brightness of the Moon arises from reflected solar X-rays. The detection of X-rays gives scientists clues about possible processes and events that may be occurring at or near the radiation sources. 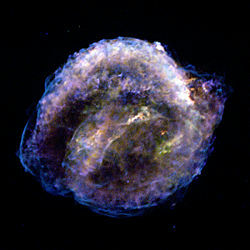 This X-ray image, taken by the Chandra X-Ray Observatory, reveals remnants of Kepler's Supernova. Nearly all of the X-ray radiation from cosmic sources is absorbed by the Earth's atmosphere. X-rays that have energies in the 0.5 to 5 keV (80 to 800 aJ) range, in which most celestial sources give off the bulk of their energy, can be stopped by a few sheets of paper. Ninety percent of the photons in a beam of three keV (480 aJ) X-rays are absorbed by traveling through just ten cm of air. Even highly energetic X-rays, consisting of photons at energies greater than 30 keV (4,800 aJ), can penetrate through only a few meters of the atmosphere. For this reason, to observe X-rays from the sky, the detectors must be flown above most of the Earth's atmosphere. In the past, X-ray detectors were carried by balloons and sounding rockets. Nowadays, scientists prefer to put the detectors on satellites. An X-ray detector may be placed in the nose cone section of a sounding rocket and launched above the atmosphere. This was first done at White Sands Missile Range in New Mexico with a V-2 rocket in 1949. X-rays from the Sun were detected by the Navy's experiment on board. In June 1962, an instrument aboard an Aerobee 150 rocket first detected X-rays from another celestial source (Scorpius X-1, mentioned below). The greatest drawbacks to rocket flights are (a) their very short duration (just a few minutes above the atmosphere before the rocket falls back to Earth), and (b) their limited field of view. A rocket launched from the United States will not be able to see sources in the southern sky; a rocket launched from Australia will not be able to see sources in the northern sky. HIREGS attached to launch vehicle while balloon was being inflated. The instrument has been on three Antarctic campaigns. Balloon flights can carry instruments to altitudes of up to 40 kilometers above sea level, where they are above as much as 99.997 percent of the Earth's atmosphere. Unlike a rocket, which can collect data during a brief few minutes, balloons are able to stay aloft much longer. However, even at such altitudes, much of the X-ray spectrum is still absorbed by the atmosphere. X-rays with energies less than 35 keV (5,600 aJ) cannot reach balloons. One of the recent balloon-borne experiments was performed by using the High Resolution Gamma-ray and Hard X-ray Spectrometer (HIREGS). 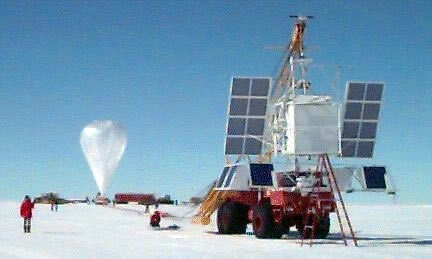 It was first launched from McMurdo Station, Antarctica, in December 1991, when steady winds carried the balloon on a circumpolar flight lasting about two weeks. The instrument has been on three Antarctic campaigns. A detector is placed on a satellite that is then put into orbit well above the Earth's atmosphere. Unlike balloons, instruments on satellites are able to observe the full range of the X-ray spectrum. Unlike sounding rockets, they can collect data for as long as the instruments continue to operate. In one instance, the Vela 5B satellite, the X-ray detector remained functional for over ten years. Satellites in use today include the XMM-Newton observatory (for low- to mid-energy X-rays, 0.1-15 keV) and the INTEGRAL satellite (high-energy X-rays, 15-60 keV). Both these were launched by the European Space Agency. NASA has launched the Rossi X-ray Timing Explorer (RXTE), and the Swift and Chandra observatories. One of the instruments on Swift is the Swift X-Ray Telescope (XRT). Also, SMART-1 contained an X-ray telescope for mapping lunar X-ray fluorescence. Past observatories included ROSAT, the Einstein Observatory, the ASCA observatory, and BeppoSAX. Most existing X-ray telescopes use CCD (charge-coupled device) detectors, similar to those in visible-light cameras. In visible light, a single photon can produce a single electron of charge in a pixel, and an image is built up by accumulating many such charges from many photons during the exposure time. When an X-ray photon hits a CCD, it produces enough charge (hundreds to thousands of electrons, proportional to its energy) that the individual X-rays have their energies measured on read-out. Microcalorimeters can detect X-rays only one photon at a time. This works well for astronomical uses, because there just aren't a lot of X-ray photons coming our way, even from the strongest sources like black holes. TES devices are the next step in microcalorimetery. In essence they are superconducting metals kept as close as possible to their transition temperature, that is, the temperature at which these metals become superconductors and their resistance drops to zero. These transition temperatures are usually just a few degrees above absolute zero (usually less than ten K). Discovery of the first cosmic X-ray source (beyond the Solar System) came as a surprise in 1962. This source is called Scorpius X-1, the first X-ray source found in the constellation of Scorpius, located in the direction of the center of the Milky Way. Based on this discovery, Riccardo Giacconi received the Nobel Prize in Physics in 2002. It was later found that the X-ray emission from this source is 10,000 times greater than its optical emission. In addition, the energy output in X-rays is 100,000 times greater than the total emission of the Sun at all wavelengths. By now, astronomers have discovered X-rays emissions from several different types of astrophysical objects. These sources include galaxy clusters, black holes in active galactic nuclei (AGN), galactic objects such as supernova remnants, stars, binary stars containing a white dwarf (cataclysmic variable stars), and neutron stars. Some Solar System bodies also emit X-rays, the most notable being the Moon, although most of the X-ray brightness of the Moon arises from reflected solar X-rays. A combination of many unresolved X-ray sources is thought to produce the observed X-ray background, which is occulted by the dark side of the Moon. It is thought that black holes give off radiation because matter falling into them loses gravitational energy, which may result in the emission of radiation before the matter falls into the event horizon. The infalling matter has angular momentum, which means that the material cannot fall in directly, but spins around the black hole. This material often forms an accretion disk. Similar luminous accretion disks can also form around white dwarfs and neutron stars, but in these cases, the infalling matter releases additional energy as it slams against the high-density surface with high speed. In the case of a neutron star, the infalling speed can be a sizable fraction of the speed of light. In some neutron star or white dwarf systems, the star's magnetic field is strong enough to prevent the formation of an accretion disc. The material in the disc gets very hot because of friction and emits X-rays. The material in the disc slowly loses its angular momentum and falls into the compact star. In the case of neutron stars and white dwarfs, additional X-rays are generated when the material hits their surfaces. X-ray emission from black holes is variable, varying in luminosity in very short timescales. The variation in luminosity can provide information about the size of the black hole. X-rays of Solar System bodies are generally produced by fluorescence. Scattered solar X-rays provide an additional component. ↑ HIREGS 1994-95 Antarctic Campaign UCSD Ballooning Homepage. Retrieved May 22, 2008. ↑ Overview of the Swift X-ray Telescope Mission Operations Center for Swift, PennState. Retrieved May 22, 2008. ↑ Introduction to Microcalorimeters X-ray Astrophysics Group, University of Wisconsin, Madison. Retrieved May 22, 2008. This page was last modified on 1 August 2013, at 14:34.